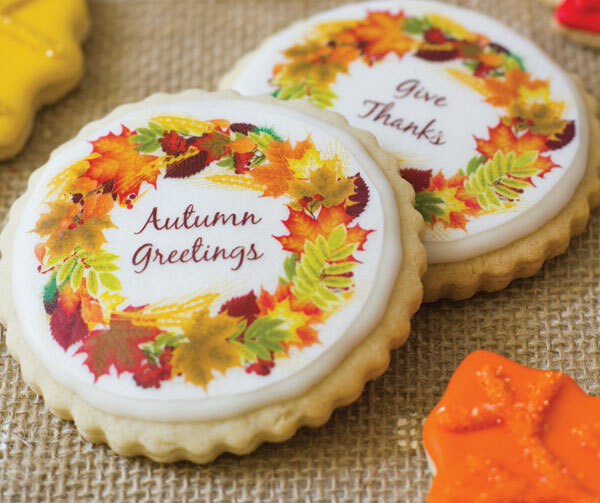 Give an edible Autumn Greeting this Thanksgiving! 1. Use No Fail Sugar Cookie recipe and cut out several circular cookie shapes with the 2.75″-3″ cutter. Bake and cool as directed. 2. Ice each cookie with 1 layer of royal icing or buttercream, if you prefer. Let completely dry. 4. Adhere each wafer paper cut-out to your cookie shape by adhering a thin layer of edible clear writing gel (or light corn syrup) to the top of the iced cookies. 6. Sprinkle a pinch of Pixie Dust to finished cookie for a sparkle effect. 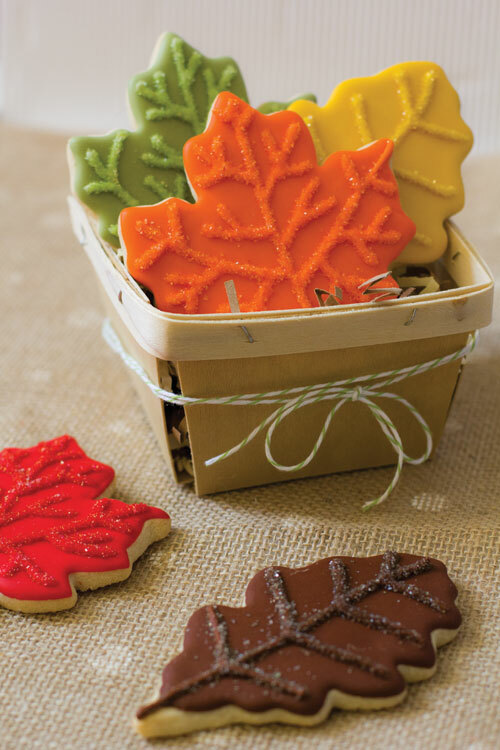 Make some sparkling Autumn leaf cookies to go with them! 1. Use No Fail Sugar Cookie recipe and cut out several leaf cookie shapes. Bake and cool as directed. 2. Make your royal icing according to mix instructions. Tint with food color to match sanding sugars. 3. Ice each cookie with 1 layer of royal icing or buttercream, if you prefer. Let completely dry. 4. Once dry, using slightly thicker icing, pipe the leaf veins and cover in matching sanding sugar while still wet. Let dry.